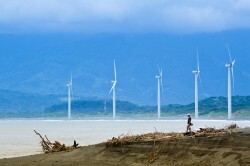 18 Apr 19 - Voters across Asia are most likely to usher in governments that take a stronger stance on climate change and other environmental issues, according to surveys released in the lead-up to national elections. 25 Mar 19 - Melting glaciers on Mount Everest have begun exposing the bodies of climbers who died on the mountain. 21 Mar 19 - Baby-turtles have officially returned to Mumbai - and it's all because one of the world’s largest beach clean-up efforts. 19 Mar 19 - Major Japanese investors, including those most indebted to coal, are seeking to back large-scale renewables projects across Asia, marking a “monumental” shift that energy market analysts say is “the start of the end for thermal coal”. 8 Feb 19 - At least a third of the huge ice fields in Asia’s towering Himalaya mountain chain are doomed to melt due to climate change with serious consequences for almost two billion people. 4 Feb 19 - Toxic smog has forced Bangkok authorities to issue an unprecedented order to shut nearly 450 schools as authorities struggled to manage a pollution crisis that has stirred widespread concern. 1 Feb 19 - Bali has announced plans to implement a tourist tax which targets plastic pollution. 12 Dec 18 - More than eight billion Tetra Paks are sold every year in Vietnam – and only a few percent are recycled. It’s having a devastating effect on the environment. 4 Dec 18 - It's a public health crisis that kills almost five million people in Asia every year. So why isn’t air pollution a bigger story? 29 Nov 18 - It's not only glaciers in Greenland and Antarctica that are feeling the effects of a changing climate. 28 Nov 18 - Busy shipyards along the coasts of South Korea, China and Japan are competing for lucrative contracts to build liquefied natural gas carriers. 15 Nov 18 - Cadbury chocolate maker Mondelçz International has destroyed more than 25,000 hectares of orangutan habitat in Indonesia, says a new report from Greenpeace. ANGKOR'S END: Did floods speed the end of ancient city? 9 Oct 18 - The world’s largest palm oil company has unveiled a plan to cut deforestation and labour abuses out of its supply chain within two years. 19 Sep 18 - Garment workers in Bangladesh have rejected an increase in the minimum wage, urging global brands to pay more for the clothes they buy. 23 Aug 18 - Thailand, struggling to deal with overflowing waste deposits following China’s trash ban last year, will bar the import of 432 types of scrap electronics. 14 Aug 18 - Ridiculed at first, the project to clean up Kual Lumpur's Klang river is on track to be completed on time and below budget. 10 Aug 18 - Indonesia is taking an explosive approach to illegal fishing ... and it's putting the industry back on a path to suistainability.